Background: In order to secure human lives the post flood disaster management system of different countries of the world was studied at united nation level, international level, individual countries level and at Pakistan level. Flood 2010 affected 11 districts of Punjab adversely but the most affected district was district Muzaffer Garh that is why it was selected as case study. Methods: The methodology includes literature review at international level, national level & local level and collection of data from different key informants. The data has been collected by systematic random sampling. The collected data was then analyzed ascertain the problem with the help of different statistical data analysis techniques. The analysis has given rise to results which lead towards conclusions and finally on the basis of these conclusions recommendation has been made. Results: On the basis of analysis of data different problems have been observed. These relate to DRR based aspects, community participation, flood early warning system, socio economic and housing aspects, preparation of flood hazard maps, awareness to the people about flood prone areas, poor building control, livelihood and job opportunities, occupation of respondents, educational level and public facilities and utilities aspects. Conclusion: On the basis of these afore mentioned results it has been concluded that due to weaker foundation and weaker super structure of houses, lack of community participation, poor flood early warning system, non-preparation of flood hazard maps by District Disaster Management Authority and Tehsil Disaster Management Committee, un-awareness to the people about flood prone areas, lack of effective building control, insufficient livelihood and job opportunities for the people of flood affected areas, low education level and less number of educational and health facilities and non-provision of public facilities and utilities are the main problems which the people of facing in flood prone areas. In the ever history of Pakistan Flood 2010 has been categorized as one of the biggest flood which caused massive destruction. In this flood 11 districts of Punjab have been affected adversely whereas the most adversely affected district is District Muzaffer Garh . About 10% area of these 11 districts were affected; crops on the above-mentioned area were destroyed. In this massive havoc millions of people became shelter less. In Punjab about 45 million houses were destroyed . Heavy rainfall, flash floods and riverine flood combined to create a moving body of water equal in dimension to the land mass of United Kingdom . The damage needs assessment amounts to Rs.219 billion/US 2.576 billion dollars. The major destruction occurred in the District Muzaffer Garh. In district Muzaffer Garh 589 villages were affected and 17, 80,226 persons were also affected. About 123427 houses were fully damaged whereas 58,764 houses were partially damaged. Post flood disaster management is concerned with damage assessment, rehabilitation, reconstruction, and mitigation activities. In pre-disaster phase risk analysis, awareness, early Warning system & long-term actions for preparedness are taken. While during disaster emergency phase is dealt. In emergency rescue, evacuation, services, and early relief activities are considered. But according to UN/ISDR, disaster management cycle comprises of four phases. The people of said flood affected area had scarce resources for livelihood and rehabilitation activities. There are also concerns about continued growth and development in flood plains interfering with natural system and ecological process . In this scenario, some NGO’S, INGO’S and government agencies came forward and initiated some on site & off site rehabilitation works. In recovery process, different strategies have been employed by different NGOS, INGOS and Government agencies. The inter-Agency Standing Committee IASC comprising of representatives of UNDP, NGO’s, INGO’s, representative of Government of Punjab & others devised a strategy known as shelter cluster strategy to provide shelter to shelter less flood affected in emergency phase. Another strategy so called community Restoration Cluster Strategy was applied for recovery process. It works on six sectors, these are food, good governance, livelihood, environment, provision of community based infrastructure and social cohesion. This strategy aims at non reliance on emergency relief and establishment of sustainable recovery through long term and large scale reconstruction activity. But in both these strategies the provision of basic community / public facilities such as parks, business & commerce activity, education, health facilities have been ignored. In most of projects carried out by NGOS and Government agencies community participation has been ignored. The community has not been mobilized through CBOS. Planned development has been discouraged whereas unplanned development has been promoted. Inadequate flood early warning System has added to financial damages of flood to great extent. All the onsite settlements are located in flood risk areas which may be affected adversely by future flooding. The strategy developed by PDMA for onsite settlements is defective . Geographic Information (GIS) models were not used for finding appropriate sites which are safe from future flooding. The strategy of PDMA suggests to provide infrastructure in case of onsite rehabilitation of colonies. But the learnt experiences advocate that Strategies for post flood housing programs need to be based on the standard housing cycle concept transitional to permanent housing . The offsite development of settlement at far off distances did not remain successful in India Resettlements of flood affected communities in India has not proved very successful due to the distant location of new site settlements from the affected ones. New locations also lacked of opportunities for livelihood . A long debate has been conducted in the light of past experiences of the world on the issue whether top down development approaches be adopted or to adopt the participatory development approaches for onsite / offsite rehabilitation of settlements. The fundamental problem in the top down development approach in which the housing development is generally governed after disaster without giving due consideration of the views of community . On the other hand, owner Driven Programs (ODP) or decentralized approach has been proved better and it has given good results . However, these issues are central to the debate on disaster recovery efforts in developed countries as well . Participation is considered most significant factor contributing towards effectiveness of rehabilitation / settlement process. Especially, how and how much it is done as communities should feel satisfied that those are better recovered . The target of sustainable development can only be achieved through citizen participation. The development made through decentralization and affected / beneficiary’s participation can lead to sustainable gain . Higher level of satisfaction of community can be achieved through involvement of community. The community and environment may be made resilient through citizen participation. Rehabilitation experience elsewhere suggests that involving affected communities can help achieving higher level of satisfaction, enhancing community awareness and resilience . Citizen participation is categorized as good strategy for rehabilitation. The World Bank has suggested it very effective strategy for this purpose . Irrigation Department has carried out 105 projects / Schemes for restoration of flood damages in Punjab Province. This includes repair and maintenance of different Bunds in the form of structural measures. Rs.1892.555 million have been incurred on these schemes. Public Health Engineering Department has incurred Rs.286.941 million on rehabilitation of 116 water supply schemes in Punjab province as structural measures. But no resources are available for any drainage scheme. But as far as the matter of non-structural measures is concerned no resources have been allocated for this purpose. Land use planning of flooded area has not been done. Flood hazard maps have not been prepared. Topographic surveys have not been conducted and Master plans of flooded area have not been prepared. Land use planners have not been hired for this purpose. DDMA’S, TDMCS and Union Disaster Management Committees are not functional but they are in Disaster Management plan. No citizen participation is seen in planning, programming, management & decision making. Bureaucratic approaches have been adopted only in relief activities. Punjab Government remains confined to emergency relief programs only; but to the sustainable recovery no due consideration has been given by the Government. There is complete lack of enforcement of Building & Zoning codes in flooded area. The capacities of TMAS have not been built to meet this requirement. Even in the TMA’S of flooded area land use planners i.e. Town Officer Planning have not been posted. Rehabilitation involves good systematic planning of settlements, skill development in communities and effective citizen participation in all development works. For effective and systematic planning resources are required. Without monitoring & evaluation the objectives can never be achieved. For this purpose efficient institutional set up is required. Offsite rehabilitation is attractive for beneficiaries but it does not contribute to social development of the communities. In both on site & off site rehabilitation activities, basic facilities and utilities are required. In onsite rehabilitation people can be involved more effectively and this factor reduces the vulnerability to great extent in flood prone areas. Different land uses and forestry also have impacts on flood. Different proper land uses and vegetation reduce the intensity of flood. Forest and development of parks in flood prone areas can play a vital role in this regard. Risk Management Models also account for land use and vegetation due to their impacts on infiltration capacity and run off . Previously non-structural measures were not considered and adopted, only structural measures were adopted which have been proved more expensive and costly and these have been proved insufficient to manage the flood. That is why world has changed their trend towards risk management policies. Although this concept of acceptable risk was not recognized at the time of adaptation . It is also observed that squatter also establish along the river banks and these cause to shorten the flood way. The flood sweeps away these squatters at first. These reduce the capacity of rivers and streams. Such areas should be used for forestry and agriculture purpose. The reason behind these squatter settlements in flood way is the absence of low income housing policy . Bugra stresses the absence of a formal policy on low income housing as the main reason behind the expansion of squatter housing. The areas near rivers be used for parks, monumental parks, land scape and active recreational facilities for jogging tracks. Flood resistant crops may be grown in flood prone areas. These dangerous areas ought not to be used for settlements. Reserve areas should be used as a reserve for functions like nature / land escape and any planning action must be compatible with this purpose . There is no question in my mind that the establishment of a monument or park on post disaster sites would be significantly more challenging than on other sites . German researchers Rehbach and Hisberger have pointed out that for post flood disaster management and its other phases legislation should be made for land use control. By this Act additional areas which are endangered by floods in case of failure of flood protection facilities are also determined . In Netherland, water managers and land use planners seek way to connect water management and spatial planning . The flood 2010 affected adversely 11 districts of Punjab. The worst affected district was district Muzaffer Garh hence it was selected as case study. Similarly the most affected tehsil was tehsil Kot Addu where 11 feet high wave of storm water swept away the houses in its way. In this tehsil out of 15 settlements, 10 settlements were taken as sample randomly; of which 5 were onsite developed and 5 were offsite developed. In these sampled settlements 2 settlements, one offsite and one onsite was developed by Govt. but remaining 8 sampled settlements (colonies) were developed by private sector and NGO’s. This research is based on a proper methodology representing part-1 on “Theoretical and experimental context of the research and part-2 showing study area, survey design, analytical methods, synthesis of analysis and formulation of recommendations and policy planning for future of safe Punjab. After initial literature review and discussion with experts I realized that post flood disaster management is a burning issue therefore I decided to conduct research on this topic. For this purpose the data was collected from NDMA, PDMA, DDMA and other departments. The data revealed that district Muzaffer Garh is the most adversely affected district in Punjab regarding flood 2010. Hence, I selected this district as case study. Similarly the worst affected tehsil in this district was tehsil Kot Addu as 11 feet high wave of flood struck against the houses of this area and swept away all these houses. The rehabilitation works were carried out by different NGO’s, private sector and by Govt. The Govt. of Punjab developed four colonies in district Muzaffer Garh; of which two were rehabilitated in tehsil Kot Addu. Amongst these two one was onsite developed and the 2nd was offsite developed. In this tehsil about 15 colonies were rehabilitated, of which 10 settlements, 5 onsite and 5 offsite were taken as sample. The names of these settlements were Basti Muslim Wala, Basti Dharamman Wala, Basti Ganji, Basti Bhulla (Sharif Model Village), Hussainy Colony, Fatima Model Village, Shahbaz Model Village, Ittehad Model Village, Al Khair Model Village and Bahria Model Village. The interviews were conducted from the flood affected people of these settlements as well as from officials of PDMA, DDMA, TMA and other related departments. From these 10 sampled settlements about 10% houses were taken as sample randomly. The data was collected regarding socioeconomic aspects, DRR based aspects (Foundation and super structure of houses) perception of people about utilities and facilities, education and health facility. Flood early warning system, community participation, flood hazard maps etc. Due to limitation of resources and remote dangerous and unsafe location of villages it was difficult to increase the sample size. Pilot survey was also conducted for pretesting of questionnaire. The collected data was analyzed with different data analysis techniques. Finally in the light of this analysis, the conclusions and recommendations were made. Table 1 shows that before flood 87% houses were mud houses made up of sun dried bricks and mud mortar was used as binding material. After flood all the houses were built of pacca bricks with cement sand mortar. Before flood the foundation of all houses in the sampled settlements was substandard. After Flood the foundation of 54.29% houses are substandard but the foundation of 45.71% houses is standardized. These houses belong to Bahria Model Village and Al-khair Model Village. Out of 10 only 2 settlements house provided adequate foundation in their houses. The respondents have told that 68.57% houses are located in safer place whereas 31.43 houses are not located in safer place and flood may come here again. 68.57% houses / settlements belong to off site development on comparatively higher place while 31.47 settlements are on site developed. The Government has provided 13.33% free of cost houses only and these are located in two settlements one is off site & other is on site developed. The table depicts that 60.95% respondents are illiterate, 24.76% are primary passed; 11.44% are middle passed whereas nearly 3% are FA & MA. 67.62% respondents are associated with farming whereas 20% do labor job and 5.71% household do their own business & 6.67% respondents do other jobs. Majority of respondents do farming & labor jobs. The table depicts that 60% households possess income 6001 to 10,000 and they are in majority. It is obvious from the table that none of the Government agency gave warning about flood well in time before the flood. The table depicts that neither any Govt. agency nor any other agency has educated the people about the flood risk areas / vulnerable areas. 90.5% respondents are facing livelihood problem while 9.5% do not. This shows that majority of respondents have job problem. They do not have proper job. 100% people have stated that they have not been involved before, during or after the implementation of plan. Therefore community / citizen participation is nil. No community organization has been established by Govt. in this area. No community-based organization exists in these settlements. The table shows that labor job was provided by the contractor to the 41.9% respondents in development of settlements & Houses. The Government did not provide any soft loan facility in order to run the business activity. The above table shows that Mosque and water supply through hand pumps have been provided to all the respondents / houses. All other utilities & public facilities have not been provided to all the respondents / houses. From analysis of 10 sampled settlements it is observed that in two offsite settlements (Bahria & Alkhair Model Village) all above utilities & Public facilities except Sui gas have been provided 60% settlements look like katchi abadies which are deprived of utilities and public facilities, the residents of these settlements are forced to live on substandard and unhygienic life. The analysis of individual settlements has revealed that the residents of 80% settlements are dissatisfied with utilities & public facilities provided in these settlements. These include representatives from Provincial Disaster Management Authority (PDMA), District Disaster Management Authority (DDMA), Tehsil Disaster Management Committee (TDMC), Union Council Disaster Management Committee (UDMC), National Disaster Management Authority (NDMA), Tehsil Municipal Administration (TMA), Punjab Local Government and Community Development Department (LG & CD Department), Punjab Public Health Department, Irrigation Department in Punjab and Representatives of Different Departments of District Government Muzaffer Garh and Representatives of Metrological Department in Lahore. In addition to these key informants the interviews were conducted from the flood affected people of 10 settlements in the case study area. The results have revealed that after flood the foundations and super structure of houses of the respondents have been improved. Before the flood the foundation and super structure of houses were substandard. In majority of houses sun dried bricks with mud mortar were used before flood but after flood in all the house pacca bricks with cement sand mortar as binding material have been used. Before flood the roofs of houses were substandard but after flood majority of roofs are of concrete slabs with concrete girders of good quality. Majority of houses of respondents are in safer places, but these houses are located in offsite developed settlements / colonies. All offsite developed settlements / colonies have been located at higher altitude where chances of future flooding are rare. But all the onsite developed settlements are located at sites where liability of future flooding is more. Although their level has been increased upto three feet, but these are not safe. Actually, such areas should be prohibited for residential use in future and be earmarked as “Prohibited Area. The table No.6 shows that majority of the houses i.e. 87% have been provided by private sector whereas Govt. has provided only 13% houses to the people. The role of Govt. should be improved. The standard of Govt. houses is also poor as compared to private sector. The table No.7 depicts that 61% respondents are illiterate whereas 25% are primary passed. That is why the majority of people do the farming job and other labour type jobs. The table No.9 shows that the income of majority of respondents (60%) ranges from 6000 to 10,000.This reflects that they possess meager income; whatever they earn, they spend it on daily life expenditure. Their saving is nothing hence they can spend nothing for better housing. The table No.12 depicts that (90%) people are facing livelihood problem and table No.14 shows that majority of the people has not been provided job by Govt. or contractor. During the development works the contractor has provided only labour job to some of the respondents. The Govt. has not made any effort to generate economic activity in the area. That is why the respondents have made a demand for provision of 2 acre piece agriculture of land from Govt. In three offsite settlements / colonies, the private sector has established vocational training centers for females / males in order to enhance the income level of households. The table No.15 & 14 shows that Govt. 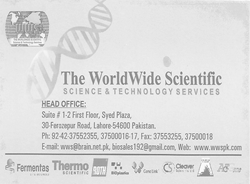 has not provided any soft loan facility for business activity and jobs opportunities for the flood affectees. It is obvious from table No.11 that PDMA, DDMA, TDMC or TMA have not prepared any flood hazard map for the affected area. No land use planning has been done of case study area. Even in the TMA of this area the technical Building Inspectors have not been posted. Proper machinery for demolition operation is not provided. There is a problem of capacity building in order to exercise effective building control. None of the tiers of disaster management has given any awareness to the people regarding flood prone areas. The respondents have stated that due to poor early warning system they could not manage evacuation and due to this factor, they suffered from huge loss in monetary terms as well loss to the lives of animals, poultry and cereal. The people have not been involved in planning, designing, management and decision making regarding rehabilitation programmes. No CBO’s have been introduced by Govt. in this area. Without effective citizen participation the goals of sustainable development cannot be achieved. “Community involvement is considered one of the most important steps for local holistic recovery.” (Natural Hazard Informer, 2002). Rehabilitation / settlement experience elsewhere suggests that involving affected communities can help achieving high level of satisfaction, enhancing community awareness and resilience . Majority of sampled settlements (colonies) are lacking basic utilities and public facilities. All the onsite developed settlements have been deprived of utilities and facilities. These are seemed as kachi abadies. That is why the respondents of these settlements have made demand for provision of basic facilities and utilities especially health facility and educational facility from Govt. Since the no of females are nearly equal to the no of males therefore the equal educational facilities & health facilities be provided to both the genders. The vocational institutions be provided in all the settlements for women in order to raise the income level of households so that the people of this area could save something for new housing. In majority of houses the foundations do not meet the yardsticks of Building Bye-Laws of Building control agency. These are still substandard. Sound foundations can stand against storm water and stagnant water of flood. These are required to be constructed in standardized way and be DRR based. In flood areas elegant pre-fabricated houses are recommended because these houses are water proof, fire proof, termite proof, anti-earthquake and heat / electric shock proof. These houses are displaceable & in case of flood these can be shifted on the other side of bank of river instead of flooded side of the river. In majority of settlements school facility does not exist. Most of the people are illiterate therefore for each settlement school facility should be provided in order to raise their literacy level. The role of Government in provision of settlements for rehabilitation is quite limited whereas the role of private sector NGOS / INGO’S and other organizations is appreciable. In rehabilitation activities the role of Government be dominant. Most of recovery programmes have been carried out by private sector. It would reduce the losses of flood to great extent regarding the loss of wheat cereal as food, loss of valuable assets & documents, mental stress& loss to cattle poultry & fishery. For their respective districts. These maps show the details of flood risk area, extremely vulnerable areas as “V” and vulnerable areas as “A” and other areas “C”. The topographic survey should be conducted in the districts and low-lying areas be designated on maps. A cell of technocrats be devised. In this cell a land use planner as head of this cell, a GIS expert, one Building Surveyor for each respective Tehsil be appointed. At present DDMA exists in papers only; it is not functional and does not exist practically. Similarly, other low tiers TDMC at Tehsil Level and UDMC at Union Council level be made functional as per duty roaster of DDRMP (District Disaster Risk Management Plan) of PDMA. The land use planner of this cell should formulate land use plan of low lying areas in their respective district after gathering informations from Building Surveyors of each Tehsil. The individual buildings and settlements should be prohibited in low lying areas. The low-lying areas should be reserved for parks & lakes. Flood resistant crops, forest, flood resistant plants & trees may be allowed in this area. Forests offer resistance to flood and are a source of healthy environment & income for the people. Development should not be made in the areas where frequency of floods is high. The frequency is required to be mentioned on flood Hazard Maps. Development be allowed by taking into view Risk Zoning Maps which identify different levels of risk. Such Risk Zoning Maps must be prepared and institutionalized. DDMAS must have broad capacity of knowledge, technical experts, qualified staff & budget for this purpose. DDMAS should prepare these maps after consultation with NGOS, local authorities and citizens. New development be made on safer areas and High-Risk Zones be declared as prohibited area for development. Existing residential areas located in high risk zone may be acquired by the planning authority for making levees & defence shield against flood. The affected residents be provided free of cost land in safer areas rather than expropriation, then prefabricated houses be constructed by Government on it. Agricultural area & natural flora adjacent to river banks may be protected from development and preserved to make room for future flood. In PLGO 2001 & in Local Government Act 2013 Tehsil Municipal Administration is responsible for exercising building control in its respective area, TMA has also power of approval of individual building plans and also grants approval to the lay out plans of housing colonies. But the TMAS could not exercise building control in flood prone areas due to their poor capacity. The TMAS should be equipped well regarding staff and machinery for demolition for building control. Loader& dumpers should be provided for this purpose to each TMA. In each Union Council a seat of Technical Secretary has been created by the Government & he has also been given the duty of Building Inspector in its respective area, but the technical secretary of UC’S have not been appointed. These technical secretaries at UC level are required to be posted at earliest. For this purpose community organization, be formed at UC level. At Union Council level the community representatives, be given briefing by the office of Union Council to make them understand about the rights of people. Different awareness and education programmes should be launched in the office of UC. The technical representatives of TDMC &DDMA’S should guide the people about flood disaster risk mitigation measures. They should also tell the people how they can make the environment & buildings resilient against flood disaster. Before launching any rehabilitation programmes, the people should be consulted in its planning, programming, designing & in decision making. In implementation and monitoring the public representation be involved. It has been learnt that some of the good recovery programmes of UN frustrated because of noninvolvement of community / citizen participation. The recovery programmes can only be successful if people are involved in planning, designing, management and decision making. 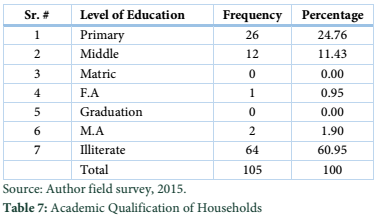 The Majority of people are illiterate and they are associated with farming and labour occupations. They have demanded to provide them 2 Acre piece of land / for each house hold. The Government has too much land in the Seed Farm area, the Government should provide it to flood affected people. By installation agro-based industries in this area the job opportunities for labour class citizens might be increased. Micro Credit Finance Schemes must be introduced for small enterprise so that people could start small business activities in their houses and could earn for living. Interest free loans be provided by the Government for business & Commerce and in order to purchase equipment’s and machinery for agriculture purpose. In provision of aid by Government to the flood affectees transparency is required to be promoted as some of the households got only Rs.20,000/- amount through Waten Card System. For this purpose in defining & assessing target groups more care be done. Health facilities like dispensary should be provided in all the settlements as majority of settlements have been deprived of it. At Tehsil headquarter level, a hospital of 500 beds must exits in order to handle different diseases. After flood Poultry& Cattle are required to be provided vaccines of different diseases which break out as after effects of flood. After flood, diarrhea & fever spreads in the flooded area, especially the babies become victims of such diseases. To combat with these diseases vaccination to children & babies is required to be provided. Government intervention is required in insurance of properties (residential & commercial building) as well as crops insurance system be introduced. Without it the people feel themselves insecure. Like developed countries job insurance system must be introduced. This will help the people in getting rid of worry of economic problems. The width of street should not be less than 30 feet in all the onsite & offsite settlements in order to lay down utility lines. The people have shown dissatisfaction because of non-availability of utilities & public facilities in all the onsite settlements such as open spaces & parks for recreation. The appropriate street width blesses an opportunity to the people to lay the utility lines at later stage through MPA & MNA Grants. In damage need assessment, identification of flooded area; level of flood, demarcation of different features and location of sites for rehabilitation make use of GIS & satellite imagery. PDMA should pass directions to City District Governments and District Governments and TMA’S to incorporate disaster mitigation measures and DRR / resilience measures& policies in preparation of Master plan / structure plan and other plans as well as in Building Bye Laws. For main road, major roads & other access roads the relevant departments, such as high way department City District Government & infrastructure Department of City Government and Tehsil Municipal Administration are responsible. All the utility departments and above stated departments provide life line structure to the community. They should fulfill their responsibilities as per DRMP plan of DDMA & PDMA. Be performed by representatives of local Government, provincial government, NGO’S, professional chambers and CBO’S (community Based Organizations). Development control and building control be exercised at TMA level. The author declare that there is no conflict of interest regarding the publication of this paper. PDMA (2010), District Disaster Risk Management Plan, Muzaffer Garh, Lawerence Road Lahore, Pakistan. UN-OCHA Pakistan flood relief and early recovery response plan. New York: office for the Coordination of Humanities Affairs United Nations (2010). Deloe R. Flood plains Management in Canada: Overview and prospects. Canadian Geographer, (2000); 44(9): 355-368. Alam J. Concept of flood shelter and its planning to cope with flood, in: Seraj, S, HodgsonR, Ahmed K.ed.village infrastructure to cope with environment. Dhaka and Exeter:BUET,PP.224-217(2000). Alnap (2008). Prevention Flood disasters. Learning from previous relief and recovery operations, available from:www.alanp.org/publications /pdfs/alnap-provention flood lessons pdf. [Accessed 14 September, 2015]. Cronian V, Guthrie P. Community-led resettlement: From a flood affected slum to a new society in Pune, India. Environmental Hazards, (2011); 10: 310-326. Schilderman T. Adapting traditional shelter for disaster mitigation and reconstruction: Experiences with community based approaches, (2004); 32(5): 414-426. Hyones M. Building Back Better. The large scale impact of small scale approaches to reconstruction. World Development, (2009): 37(2); 385-389. Stor VH. Can decentralized bottom up post disaster recovery be “Effective”? Virginia working paper, (2010); No.10-17. Oliver S. Successes and failure in post disaster resettlement. Disaster, (1991); 15(1): 12-23. Alexander D (2004). Planning for past-disaster reconstruction. In: 2nd International Conference on Post – Disaster reconstruction: Planning for Reconstruction, 22-23 April, Coventry University. Available from: http: //www.grif.un.montreal.ca/pages/irrepublicn.html (Accessed 16 May, 2016). World Bank (2001) Involuntary resettlement instruments. The World Bank Operational Manual. Frampton S. (1996). Natural Hazards: causes, consequences and management, by Redwood Books. GB. P.Pilon, (2003) “Guidelines for Reducing Flood Losses” United Nations. (http:www.unisdr.org/eng/library/isdr-publication/flood-guidelines/isdr-publication-flood.htm). Bugra A. The immoral Economy of Housing Turkey, International Journal of Urban and Regional Affairs, (1998); 22(2): 283-302. Friesecke F, (2004). “Precautionary and Sustainable Flood Protection in Germany” Strategies and Instruments of Spatial Planning, PP.10-11, in 63rd FIG Regional Conference 3-7th October 2004. Jakerta, Indonesia (http://www.fig.net/pule/jackarta/papers/ts/ts16/ts162friesecke.pdf). Emetaz V, (2008) Personal Communication, email. March 1. Emetaz was the Recreation Staff Officer at Mount Saint Helens National Volcanic Monument from 1982-1988. Rehbach J, Hinsberger T, (2008). Prospective Risk Management: Review of German Legislation Targeting Integral Flood Management, Working Paper No.7/2008. UNU_EHS,BONN.(http://www.ehs.enu.edu./file.php?id=487). Woaltjer J, Al N. Integrating Water Management and Spatial Planning: Strategies based on the Dutch experience. Journal of the American Planning Association, (2007), 73(2): 211-221.